In a developing story on the allegation by the co-convener of ‘Our Mumu Don Do Movement’ Charles Chukwuemeka Oputa aka Charlyboy that Deji Adeyanju leaked an audio of the conversation between them just because he wanted a share of the 9-figure he received from Festus Keyamo, SecretReporters can authoritatively report that Charly Boy lied as he only received just 4 million as against his claim. Information gathered from one of his crew member, Jide Kol, a one-time photographer and media aide to the movement revealed that though Charly Boy actually received money from Festus Keyamo whom he claimed was a friend and have been together since the days of yore, the 9-figures was nothing but an exaggeration allegedly to make the public believe his side of the story that Deji was desperately after his share f the money. According to Jide Kol who disclosed that he had to leave the Mumu Don Do Movement not just because the whole cause was solely funded by one man(Charly Boy) who he reiterated never hides anything from anyone but also because he needed a favorable space to do business and explore his craft, people like Fani Kayode approached them during the #ResumeOrResign protest sometime in August 2018 and they unanimously agreed to avoid any politician because to them money was not the motivation for the movement. 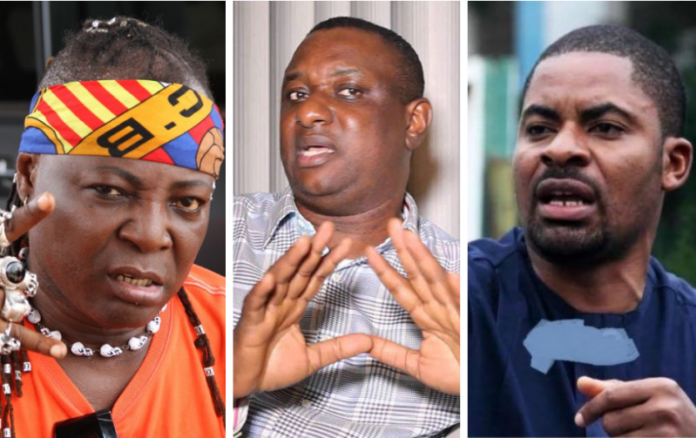 However while Deji Adeyanju was locked up, Festus Keyamo visited Charly Boy at the Boulevard (Charly Boy’s home) and after they talked about Deji’s detention he asked for support for his cause from Keyamo as an old friend. “As for the 9 figures matter, Area Father told me he only said that for the hype, he said he was given 4 Million Naira, you can confirm from Festus,” Jide stated. Though he was once a member and also participated in series of protests against the government of President Muhammadu Buhari, Jide Kol feels sad on how partisanship has successfully masqueraded itself into the coalition between the one time politician turned human right activist, Deji Adeyanju and one of Nigeria’s most controversial entertainers, His Royal Punkness Charly Boy.